Don Ceremello is standing watch outside the front door when I arrive at the Colombo Club. He’s wearing a navy sweatshirt with the Italian flag embroidered proudly across the left breast. Graying two-day stubble pokes through the well-tanned skin on his face and neck. He stops me as I head for the entrance—he wants to know what my business is at the club. I explain that I’m here to see Angelo, the bar manager, and that he’s expecting me. This seems to fly with Don, because he waves his arm in front of him, ushering me through the heavy wooden door and into the darkness beyond. The room is dusky even though outside the sun is still high. Dim light peeps out of dropped chandeliers the shape of scallop shells. Behind the long curving bar, a neon Peroni sign gives off a faint fluorescence. Sitting at a table next to a portrait of Tony Tedeschi, the Colombo Club’s brawny current president, Angelo Magurno is waiting for me. It’s the middle of the afternoon and the place is empty, which explains why he is next to the bar instead of behind it. He gets up slowly, smiling as he greets me despite the stiffness in his joints. He wastes no time in showing me around. In the banquet hall, sixteen tables—each one laid out with settings for forty people—stretch the length of the cheerfully lit room. In the old days there had been benches here, where everyone sat picnic table-style, but these days the hall is filled with chairs instead. On a raised platform at one end of the room sits the table of honor, where hundreds of wedding and anniversary toasts have been delivered over the years. On a night like tonight, that table will be reserved for the club’s president, vice president, and the board of directors. Tonight is the first Thursday of the month, the monthly birthday dinner. Boys night. In a few hours time this room will be filled hundreds of men, from the newly of-age to the very geriatric. They will greet each other as old friends, raise their endless glasses of wine to toast each other’s good health, and spend the evening basking in the glow of good food, spirits, and fraternity. At least this is how I imagine it, from what Angelo tells me. I won’t be able to actually attend the dinner tonight for two reasons. The first is that I am not a member of the Colombo Club, the oldest Italian social club West of the Mississippi River, and one of the largest in America. The second is that I am a woman. Between 1880 and 1920 more than four million Italians immigrated to America to escape the poverty, overpopulation and high unemployment of their home country. Many immigrants, after enduring the month-long Atlantic crossing, then took a 3,000-mile train ride, known as the Overland Route, to California, eventually settling in the Bay Area as farm laborers, garbage collectors and quarry workers. The Bilger Quarry, which once occupied the area where the Rockridge Safeway and Shopping Centre now stands, employed hundreds of young Italian men to manually crush sandstone and quartz into gravel needed to pave roads for a new invention—the automobile. The men, being mostly unmarried, or having left wives back in Italy, stayed in the quarry boardinghouses and dealt with their loneliness by playing cards in the basement of a neighbor, Maggiorino Lovisone. The basement was a place to enjoy traditional foods and commiserate about the grueling quarry work in their native language. This was the beginning of the Colombo Club. In 1920, Lovisone and a group of 34 men formally founded the club and purchased a small building at 49th and Broadway to house their social activities. In 1922 they officially incorporated as the Colombo Club, with the mission to preserve the Italian culture while simultaneously nurturing the ideals of American citizenship. By 1949 the club’s membership had outgrown the building, and in 1951 construction was completed on the building that still stands today at 53rd and Claremont. The Colombo Club is much bigger than its unassuming exterior would lead you to believe. Adjoining the main room on the first floor is Colombo Hall, where vaulted ceilings open up above a ballroom floor large enough to fit 200 dancing couples. On one end, a raised stage where live bands have played tarantellas and strambottas for decades lies quiet and empty for the moment. At the other end hang the flags of Italy’s 20 regions. The white cross of Piedmonte, the silver stars of Liguria, and the tree and column of Calabria represent the regions where most of the Colombo Club’s 1,000-strong membership claim their roots. Angelo’s parents are from Calabria—the heel of the boot—but he was born and has lived his whole life here in Oakland. 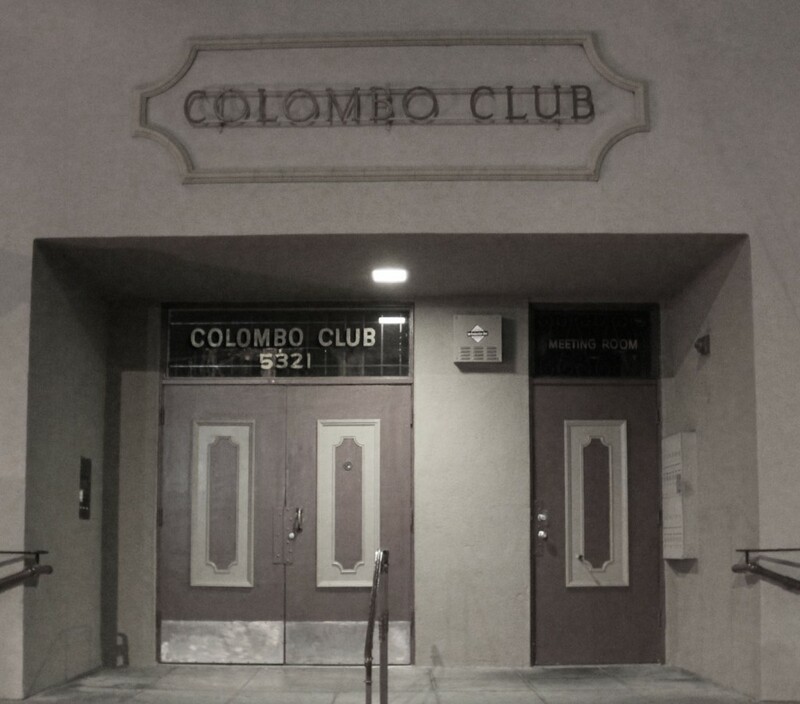 Since he became a member back in 1965, the Colombo has been his home away from home. Downstairs, in the vast and immaculately scoured kitchen, mountains of linguini rest in stacked steel trays. Pots big enough for a small child to stand in bubble away on the range, and dozens of white coffee pots stained brown from decades of after-dinner service are lined up at attention, each awaiting its moment of usefulness. Last but not least, Angelo takes me to the Isabella room, where all the Club’s historical artifacts are kept. The room used to be a bocce alley, but the inlaid brick lanes have since been covered up with wooden flooring. He warns me that the cooks, who are also members, might be in here sleeping. “They got here at four in the morning,” he says. “They need to get some rest before dinner.” Sure enough, swaddled in their long, white kitchen aprons and sound asleep, three of the cooks lay face-up on a trio of couches. The fourth cook sits in a chair watching a muted television, his thick arms crossed over a sizable paunch that is the reason for his wide-strapped suspenders. His name is Jerry Pretori, and unlike his compatriots, he can’t sleep. Which works out well because Angelo has to go. So they hand me off, Angelo assuring me that I’m in good hands. Looking at a number of card tables in the room I ask Jerry if they play a lot of poker. He chuckles and shakes his head. “Pedro,” he says. Pedro, pronounced PEE-droh, is a complicated game. According to Jerry it’s kind of like an Italian version of rummy, mixed in with a bit of bridge. There are tricks and trump suits and point cards. The five is your pedro. The game is played to 32. You can play with a lot of people, and the games tend to get pretty heated. Don comes in from the main room and joins us at one of the card tables. He’s impressed that I know what a trump is. “We should get her down here to play with us some time,” Don says to Jerry. Jerry cracks a sly smile and chuckles some more. “You don’t want to be down here for that,” he tells me. “There’s an awful lot of yelling and cursing. It’s not a place for a nice young lady such as yourself.” I tell him I’m not as nice as I look. It’s getting late. Jerry runs his hands through the ring of silvery white curls on his head. “I have to go get my hair cut before dinner,” he says, politely excusing himself back to the bowels of the kitchen. “One of our other cooks moonlights as a barber occasionally,” he adds, winking as he departs. While you may not have to be Italian to join the Colombo Club, you will need to have plenty of patience if you want to get in. With the proper proof of Italian lineage on at least one side of the family and a current member to sponsor you, the waitlist for membership is about two to three years. For a non-Italian, the wait is closer to ten. But lots of people do it. About one-third of the club’s 1,000 members are considered non-Italians by the Colombo’s standards, though they are all welcomed into the folds of this rich social experience with open arms. Gender is a more strictly enforced qualification. Only men can be club members. More specifically, only men ages 21 and older. There is a women’s auxiliary with about 200 members that organizes its own affairs and has use of the club for events and activities. And wives, girlfriends, and family members are invited to many events at the club. These events include birthday dinners a few times a month for members only, family dinners and dances on the last Sunday of the month, tea parties hosted by the Women’s Auxiliary, and a yearly past-presidents dinner. Italian classes are offered monthly for the children of club members. There are yearly trips to Golden Gate Fields for a day at the track, Yosemite for a taste of nature, and Reno for going out on the town. Today, the club’s social calendar retains much of the flavor of the old days, but without the same pace and intensity it once had. Ray turns 84 this month. He has been a member of the Colombo Club for 52 years. Both of his kids got married here. And later this year he and his wife will celebrate their 60th wedding anniversary here as well. “I mean, it’s basically been my whole life, besides my family,” he says about the club, where he was the president for two years back in ’85 and ’86. Ray still looks young. In fact he still looks pretty much just like his presidential portrait that hangs near the front door, smiling behind thick wire-framed glasses. He’s wearing a tan zip-up Colombo Club windbreaker and boat shoes the day I meet him. He greets me warmly with a hug and a light kiss on the cheek even though I’ve kept him waiting for our appointment. When I ask him about how he’s seen the club change over the years he gets quiet for a few moments before answering. Ray was born in America and doesn’t speak Italian, (his greatest regret in life) but his parents did and his wife does, though she gets too embarrassed to speak it around him. Their daughter got married (at the club) to a non-Italian. And with many Italian families having left the Temescal neighborhood for places like Pleasanton and Walnut Creek, there just aren’t as many opportunities for young Italian girls and boys to meet and get married and make more Italian babies. Despite the changes, the club is still standing, nearly a hundred years after its inception. It has survived America’s wars in Europe, Asia and the Middle East. It has weathered economic booms, bubbles and meltdowns. And in a world where people increasingly interact with the click of a mouse rather than the clink of a glass, the Colombo Club is like a port in the storm—providing a home away from home for its members and their families—a place to eat, drink, remember the good old days of yesterday, and look ahead to the good times still yet to come. Between 1880 and 1920 more than four million Italians came to America in search of a brighter future. 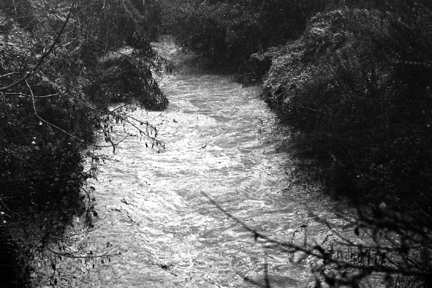 A number of factors drove these massive transatlantic migratory waves; overpopulation, unemployment, and limited resources were the main drivers of the diaspora, but a series of natural disasters around the turn of the century that left hundreds of thousands homeless and jobless also contributed to the Italian displacement. Most of the immigrants were single men in their teens, twenties and thirties from the Italian peasant class. Many of them headed west to seek out jobs in the young state of California. After the San Francisco earthquake of 1906 many Italians relocated across the bay—by the 1930s Oakland had one of the largest Italian-American populations in the state. Within Oakland the place to live was the bustling neighborhood of Temescal. The area around 51st St. and Telegraph Ave. became the commercial hub of Oakland’s “Little Italy.” There were many Italian small businesses, from delicatessens and bakeries to barbershops and shoe-shine stands. There was even a movie theater. Social clubs such as the Ligure, Fratellanza, and Colombo clubs had bocce leagues, family dinners, and monthly dances. Referred to by residents simply as “The Neighborhood”, Temescal had everything and Italian away from the mother country could want—including the languages and smells of home. A number of modern business establishments grew out of early Italian pioneering and work ethic. Several Italian families began garbage-collecting operations that eventually grew into a co-op called the Oakland Scavenger Company. It was a job that required little English or training and was a lifeline for many new Italian immigrants. The company was eventually bought by Waste Management in 1986. The Bank of America, which is today the second largest bank holding company in the United States, began as the Bank of Italy. It’s founder, A.P. Giannini, had a branch at the Embarcadero in San Francisco and the corner of 48th and Telelgraph in Temescal. The bank lent and employed local Italians before growing into the multinational corporation it is today. With the arrival of affordable automobiles and a freeway system in Oakland, the era of Temescal as an Italian commercial and social hub came to a close. The electric street car lines that ran on Telegraph and Shattuck stopped service in 1948, a change that transformed the neighborhood forever. Many families, with newfound wealth and access to personal transportation, left Temescal for places like Martinez, Walnut Creek, and Vallejo. Some of the old establishments remain—the Colombo Club and Genova Delicatessen are both still alive and well near the intersection of 51st and Telegraph—but the heyday of the Oakland’s Little Italy has since faded to make way for the young techy professionals that have driven the more recent gentrification of Temescal. The Colombo Club at 53rd and Claremont has been a social gathering place for Italians in Oakland for almost 100 years. Photo by Amna Hassan. I’ve never gotten a good answer to how and why most of the Italian American residents moved away. Best I can tell from talking to those who remained, was that it occurred very rapidly over less than a decade. I’m not convinced that it was white flight as some have suggested. The grandson of the first treasurer of the Colombo Club still lives on my block, behind the currently still standing original Club building. The rear entrance to the club went thru his backyard because the residents of the club were informal about such things as property lines and setbacks when it came to their club. You captured the spirit of the Club Megan! A great article. One of my favorite parts of being associated with the Colombo Club comes after the great Colombo Club dinner. On the dance floor you get to see loving couples who’ve spent their lives together waltzing and dancing like old movie stars. Some come dressed in special shoes and frilly skirts all designed for dancing. Where else can you see that? It’s a wonderful honor to be a part of it. I love to watch and maybe pick up a smooth dance step to use sometime! Great article! I grew up going to the Colombo Club – my parents, know in their early 70’s – still go to the Club for dinner and dancing every month. My father served on the board for many years and my parents celebrated special occasions, as well as met many close friends, at the club. Now with two kids of my own, the tradition lives on and I am taking them to events at the Colombo Club. It is a wonderful place loved by many….